These three men were murdered by unknown offenders and officers need your help in solving these cases. Raymond Gutierrez, Jared Martinez, and Daniel Lovato Jr. are all men who were murdered by unknown offenders and have cases that remain unsolved. 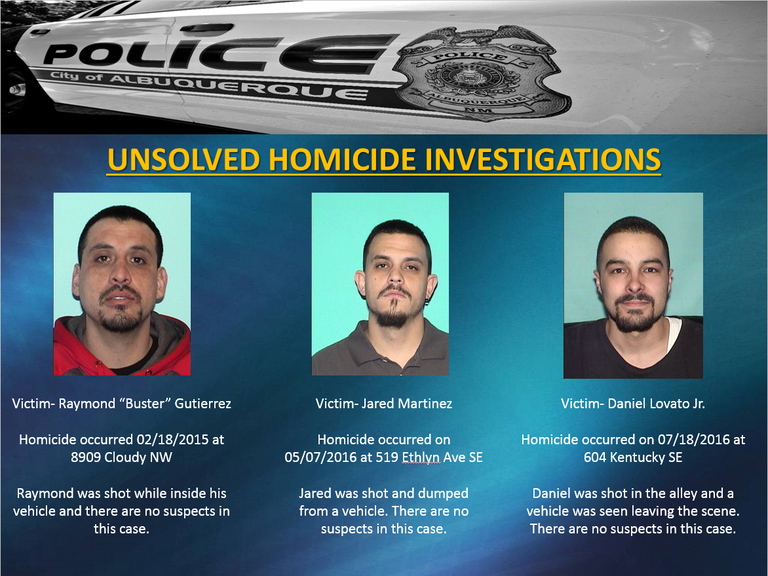 The Albuquerque Police Department Violent Crimes Unit needs your help in solving these crimes. 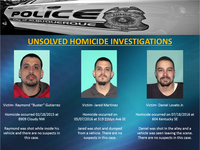 The Albuquerque Police Department does not typically release photos of homicide victims. However in these cases the detectives have investigated every possible lead on each case and at the request of the victims families we have agreed to release these photos. The Albuquerque Police Department was given permission to use these photos by the families for the Albuquerque Police Department to use in an attempt to solve these cases. Raymond “Buster” Gutierrez was shot while inside his vehicle located at 8909 Cloudy NW which occurred on 02/18/2015. Detectives have worked all the leads and still have no suspects identified in this case. Jared Martinez was shot and pushed from a vehicle on 05/07/2016 at 519 Ethlyn Ave SE. Detectives have worked all the leads and still have no suspects identified in this case. Daniel Lovato Jr. was shot in the alley and an unknown make or model vehicle was seen leaving the scene. This occurred on 07/18/2016 at 604 Kentucky SE. Detectives have also worked all the leads and still have no suspects identified in this case. We are asking anyone that may have seen these men with other people or may have just been in the area when these crimes occurred to contact Crime Stoppers at 843-STOP. No matter how small the detail someone may have, it may be enough to solve these cases. You can remain anonymous and information leading to the arrest of these offenders could earn you a cash reward.